Tameka Harris is a LEAP facilitator who teaches a Time Management class on Monday afternoons. 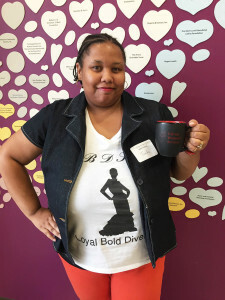 In addition to teaching the Time Management class, she also serves meals at Calvary with a women’s group called LBD (Little Black Dress) Socials. Tameka enjoys her time volunteering so much that she has successfully recruited her fiancé to serve meals, too. When we asked Tameka to describe Calvary in one word, she chose this one: “MAGNIFICENT!” We think Tameka is pretty magnificent herself. I first heard about Calvary from my mother, who participated in the program a few years back. I was reconnected to Calvary through the LBD Socials group that I am a member of. I volunteer at Calvary in honor of my grandmother, who was an outstanding service member in our community. As a child, she would take me with her to serve, feed, donate and lead. Those core values never left my heart. I genuinely enjoy sharing my time and knowledge with others. I like seeing women’s faces light up when they speak about progress and changes in their lives. I feel overjoyed each time I walk in and women have small successes to share with me. Calvary has a great staff that treats volunteers like family, and that makes it fun instead of work. My most memorable experience at Calvary was completing my first eight-week session teaching Time Management. One of the ladies gave me a hug with tears in her eyes and said that what she learned helped her eliminate stress in her life and motivated her to stay clean, sober and organized. I tell people all the time how awesome Calvary is. I encourage anyone to get involved. Calvary will find a place for you to share your talents or skills where they are needed. If you want to volunteer somewhere that is fun, where you are appreciated and where you can make a huge difference in people’s lives, Calvary is the place to do it.